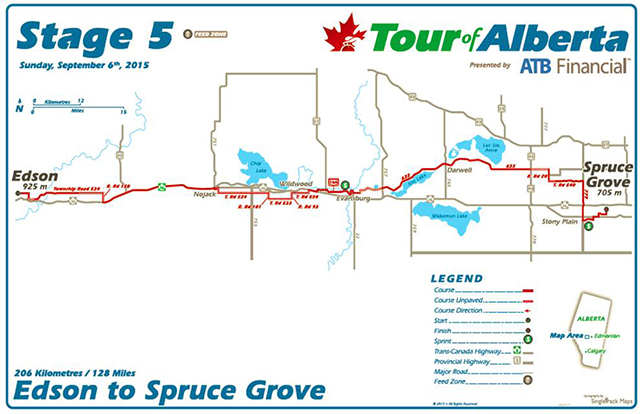 The race: For the Tour of Alberta's final stage, at least Mother Nature relented a bit and didn't rain or snow on the riders. A small group got clear, but the sprinters' teams timed things perfectly to catch the escapees near the finish to allow for the speedy guys to go for the stage win. 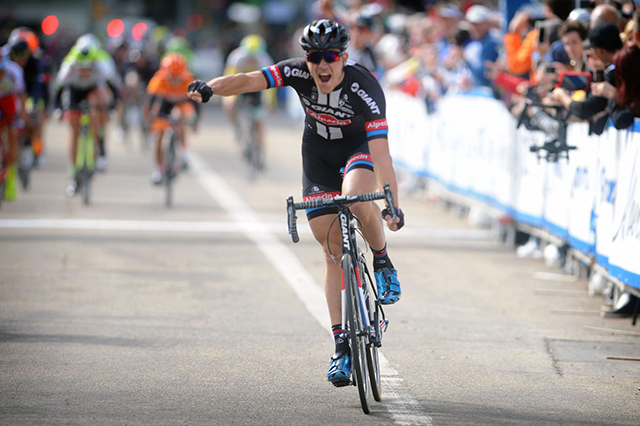 Giant-Alpecin rider Nikias Arndt just beat Michael Matthews for the stage win. 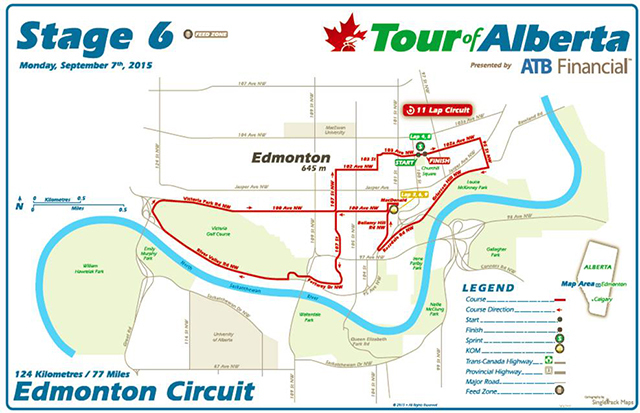 GC leader Bauke Mollema finished twelfth to become the final overall winner of the third edition of the Tour of Alberta. 2 Michael MATTHEWS ORICA-GREENEDGE s.t. 3 Dion SMITH HINCAPIE RACING s.t. 4 Wouter WIPPERT DRAPAC s.t. 5 Sam BENNETT BORA-ARGON 18 s.t. 7 Aleksei TCATEVICH KATUSHA s.t. 8 Justin OIEN AXEON CYCLING s.t. 9 Alexander RAY SILBER PRO CYCLING s.t. 10 Miguel BRYON HINCAPIE RACING s.t. 11 Ryan ANDERSON OPTUM s.t. 12 Bauke MOLLEMA TREK s.t. 13 Sergey LAGUTIN KATUSHA s.t. 14 Florenz KNAUER H&R BLOCK s.t. 15 Travis MCCABE SMART STOP s.t. 16 Tobias LUDVIGSSON GIANT-ALPECIN s.t. 17 Adam YATES ORICA-GREENEDGE s.t. 18 Chad BEYER LUPUS RACING TEAM s.t. 19 Tom Jelte SLAGTER CANNONDALE-GARMIN s.t. 20 Paul VOSS BORA-ARGON 18 s.t. 22 James ORAM AXEON CYCLING s.t. 23 Geoffrey CURRAN AXEON CYCLING s.t. 24 Kris DAHL SMART STOP s.t. 25 Grégory RAST TREK s.t. 26 Viacheslav KUZNETSOV KATUSHA s.t. 27 Georg PREIDLER GIANT-ALPECIN s.t. 28 Christian MEIER ORICA-GREENEDGE s.t. 29 Phil O'DONNELL AXEON CYCLING s.t. 30 Michael WOODS OPTUM s.t. 31 Sven erik BYSTRØM KATUSHA s.t. 32 Andzs FLAKSIS HINCAPIE RACING s.t. 33 Toms SKUJINS HINCAPIE RACING s.t. 34 Alexandr BRAICO JELLY BELLY s.t. 35 Joseph LEWIS HINCAPIE RACING s.t. 36 Kyle MURPHY LUPUS RACING TEAM s.t. 37 Davide FORMOLO CANNONDALE-GARMIN s.t. 38 Travis MEYER DRAPAC s.t. 39 Guillaume BOIVIN OPTUM s.t. 40 Adam DE VOS H&R BLOCK s.t. 41 Lasse Norman HANSEN CANNONDALE-GARMIN s.t. 42 Joshua BERRY JELLY BELLY s.t. 43 Nathan BROWN CANNONDALE-GARMIN s.t. 44 Edward KING CANNONDALE-GARMIN s.t. 45 Taylor SHELDON JELLY BELLY s.t. 46 Dominik NERZ BORA-ARGON 18 s.t. 47 Ryder HESJEDAL CANNONDALE-GARMIN s.t. 48 Ryan ROTH SILBER PRO CYCLING s.t. 49 Simon SPILAK KATUSHA s.t. 50 Fredrik LUDVIGSSON GIANT-ALPECIN s.t. 51 Sergei CHERNETSKI KATUSHA s.t. 52 Matthieu JEANNES LUPUS RACING TEAM s.t. 53 Christoph PFINGSTEN BORA-ARGON 18 s.t. 54 Jan BARTA BORA-ARGON 18 s.t. 55 Daniel EATON AXEON CYCLING s.t. 56 Gavin MANNION JELLY BELLY s.t. 57 Ilnur ZAKARIN KATUSHA s.t. 58 Scott THWAITES BORA-ARGON 18 s.t. 63 Chad HAGA GIANT-ALPECIN s.t. 65 Michael HEPBURN ORICA-GREENEDGE s.t. 67 Nigel ELLSAY SILBER PRO CYCLING s.t. 68 Winston DAVID LUPUS RACING TEAM s.t. 69 Kristoffer SKJERPING CANNONDALE-GARMIN s.t. 70 Scott ZWIZANSKI OPTUM s.t. 71 Cesare BENEDETTI BORA-ARGON 18 s.t. 72 Malcom RUDOLPH DRAPAC s.t. 73 Steve FISHER JELLY BELLY s.t. 74 Jacob SCHWINGBOTH H&R BLOCK s.t. 75 Garrett MCLEOD H&R BLOCK s.t. 76 Svein TUFT ORICA-GREENEDGE s.t. 77 Bailey MCKNIGHT H&R BLOCK s.t. 78 Laurent DIDIER TREK s.t. 83 Hayden ROULSTON TREK s.t. 84 Matthew BUSCHE TREK s.t. 85 John HORNBECK HINCAPIE RACING s.t. 86 Marco COLEDAN TREK s.t. 87 Chris PUTT AXEON CYCLING s.t. 88 Benjamin PERRY SILBER PRO CYCLING s.t. 89 GREGORY DANIEL AXEON CYCLING s.t. 90 Matteo DAL-CIN SILBER PRO CYCLING s.t. 91 Alexander CATAFORD SILBER PRO CYCLING s.t. 92 Derrick ST JOHN SILBER PRO CYCLING s.t. 93 William CLARKE DRAPAC s.t. 94 Jens MOURIS ORICA-GREENEDGE s.t. 95 Jesse ANTHONY OPTUM s.t. 96 Lachlan David MORTON JELLY BELLY s.t. 99 Michael OLHEISER LUPUS RACING TEAM s.t. 100 Tyler MAGNER HINCAPIE RACING s.t. 19 Nathan BROWN CANNONDALE-GARMIN s.t. 25 Taylor SHELDON JELLY BELLY s.t. 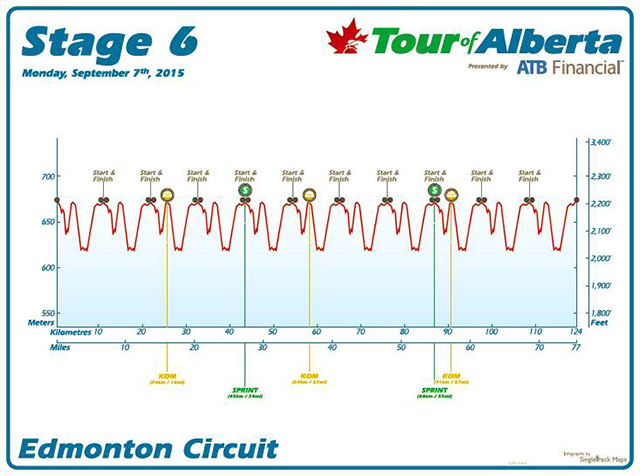 The race: This was a wet, cold and confusing day of racing in Alberta. There were planned dirt-road sectors, but with the rain, most were eliminated. A small group went clear and from them Lasse Hansen launched himself on a solo adventure with about forty kilometers to go. And that was that. Kinda. Chasing Hansen was Sven Bystrom. As he went through an intersection, course marshals tried to direct him to turn. Bystrom in head-down, time-trial mode, did not see them and did not take the turn. Worse, the peloton followed Bystrom off the course. That meant only Lasse Hansen was on the course. The peloton was led back on to the course. 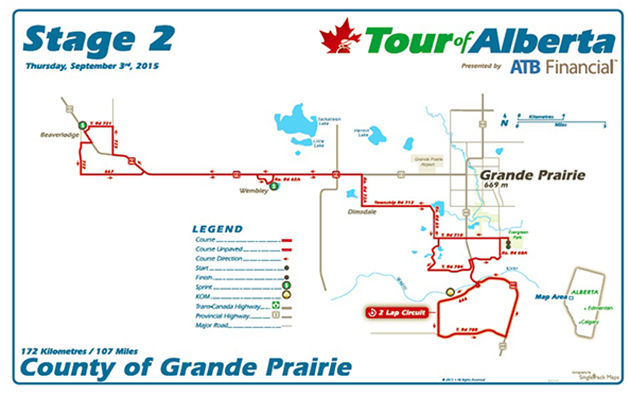 The stage called for two finishing laps in Spruce Grove. The judges decided to call it a day and neutralized the two circuits. Hansen was well into his second lap when he was informed that he had won the stage. Bauke Mollema finished third to maintain his GC lead. 2 Laurent DIDIER TREK s.t. 3 Bauke MOLLEMA TREK s.t. 4 Viacheslav KUZNETSOV KATUSHA s.t. 5 Aleksei TCATEVICH KATUSHA s.t. 6 Marco COLEDAN TREK s.t. 7 Wouter WIPPERT DRAPAC s.t. 8 Alexander RAY SILBER PRO CYCLING s.t. 9 Michael HEPBURN ORICA-GREENEDGE s.t. 10 Jan BARTA BORA-ARGON 18 s.t. 11 Jasper BOVENHUIS CANNONDALE-GARMIN s.t. 12 Ryan ANDERSON OPTUM s.t. 13 Sam BEWLEY ORICA-GREENEDGE s.t. 14 Nikias ARNDT GIANT-ALPECIN s.t. 15 Sergey LAGUTIN KATUSHA s.t. 16 Guillaume BOIVIN OPTUM s.t. 17 Hayden ROULSTON TREK s.t. 18 Michael MATTHEWS ORICA-GREENEDGE s.t. 19 Davide FORMOLO CANNONDALE-GARMIN s.t. 20 Sam BENNETT BORA-ARGON 18 s.t. 21 Fredrik LUDVIGSSON GIANT-ALPECIN s.t. 22 Alexander CATAFORD SILBER PRO CYCLING s.t. 23 Shane ARCHBOLD BORA-ARGON 18 s.t. 24 Peter KONING DRAPAC s.t. 25 Dion SMITH HINCAPIE RACING s.t. 26 Logan OWEN AXEON CYCLING s.t. 27 Paul VOSS BORA-ARGON 18 s.t. 28 Ryan ROTH SILBER PRO CYCLING s.t. 29 Miguel BRYON HINCAPIE RACING s.t. 30 Adam YATES ORICA-GREENEDGE s.t. 31 Georg PREIDLER GIANT-ALPECIN s.t. 32 Scott THWAITES BORA-ARGON 18 s.t. 33 Michael WOODS OPTUM s.t. 34 Toms SKUJINS HINCAPIE RACING s.t. 35 Tobias LUDVIGSSON GIANT-ALPECIN s.t. 36 Travis MEYER DRAPAC s.t. 37 Kristoffer SKJERPING CANNONDALE-GARMIN s.t. 38 Tom Jelte SLAGTER CANNONDALE-GARMIN s.t. 39 Sven erik BYSTRØM KATUSHA s.t. 40 Ilnur ZAKARIN KATUSHA s.t. 41 Christoph PFINGSTEN BORA-ARGON 18 s.t. 42 John HORNBECK HINCAPIE RACING s.t. 43 Scott ZWIZANSKI OPTUM s.t. 44 Alexander PORSEV KATUSHA s.t. 45 Grégory RAST TREK s.t. 46 Sergei CHERNETSKI KATUSHA s.t. 47 Svein TUFT ORICA-GREENEDGE s.t. 48 Simon SPILAK KATUSHA s.t. 49 Joshua BERRY JELLY BELLY s.t. 50 Travis MCCABE SMART STOP s.t. 51 Christian MEIER ORICA-GREENEDGE s.t. 52 Benjamin PERRY SILBER PRO CYCLING s.t. 53 Luke DURBRIDGE ORICA-GREENEDGE s.t. 54 Evan HUFFMAN SMART STOP s.t. 55 Travis LIVERMON SMART STOP s.t. 56 Andzs FLAKSIS HINCAPIE RACING s.t. 57 Geoffrey CURRAN AXEON CYCLING s.t. 58 Justin OIEN AXEON CYCLING s.t. 59 Tom ZIRBEL OPTUM s.t. 60 Kyle MURPHY LUPUS RACING s.t. 61 James ORAM AXEON CYCLING s.t. 62 Chad HAGA GIANT-ALPECIN s.t. 63 Daniel EATON AXEON CYCLING s.t. 64 Ryder HESJEDAL CANNONDALE-GARMIN s.t. 65 Jens MOURIS ORICA-GREENEDGE s.t. 66 Matthew BUSCHE TREK s.t. 67 Alexandr BRAICO JELLY BELLY s.t. 68 Derrick ST JOHN SILBER PRO CYCLING s.t. 69 Jesse SERGENT TREK s.t. 70 Nathan BROWN CANNONDALE-GARMIN s.t. 71 Taylor SHELDON JELLY BELLY s.t. 73 Angus MORTON JELLY BELLY s.t. 74 Lachlan David MORTON JELLY BELLY s.t. 77 Joseph LEWIS HINCAPIE RACING s.t. 78 Malcom RUDOLPH DRAPAC s.t. 79 Bernard SULZBERGER DRAPAC s.t. 81 Matthieu JEANNES LUPUS RACING s.t. 83 Jesse ANTHONY OPTUM s.t. 84 Steve FISHER JELLY BELLY s.t. 85 Chad BEYER LUPUS RACING s.t. 86 GREGORY DANIEL AXEON CYCLING s.t. 87 Adam DE VOS H&R BLOCK s.t. 88 Dominik NERZ BORA-ARGON 18 s.t. 89 Winston DAVID LUPUS RACING s.t. 91 Phil O'DONNELL AXEON CYCLING s.t. 92 Zachary BELL SMART STOP s.t. 93 Will ROUTLEY OPTUM s.t. 94 Graeme BROWN DRAPAC s.t. 95 Michael LE ROSSIGNOL SILBER PRO CYCLING s.t. 96 Cesare BENEDETTI BORA-ARGON 18 s.t. 97 Shane KLINE SMART STOP s.t. 98 Michael OLHEISER LUPUS RACING s.t. 99 Nigel ELLSAY SILBER PRO CYCLING s.t. 100 Kris DAHL SMART STOP s.t. 101 Chris PUTT AXEON CYCLING s.t. 102 Mac BRENNAN HINCAPIE RACING s.t. 103 Julian KYER SMART STOP s.t. 105 Gavin MANNION JELLY BELLY s.t. 109 Bailey MCKNIGHT H&R BLOCK s.t. 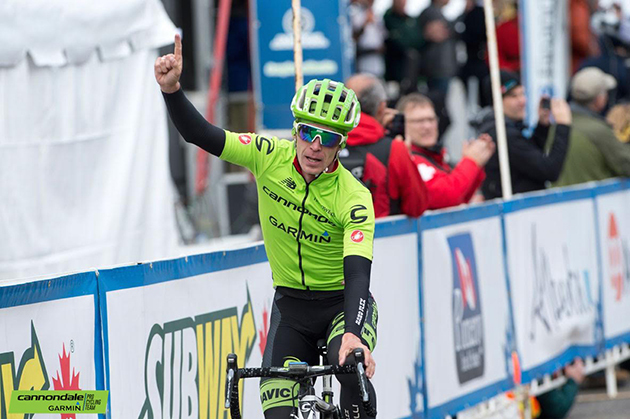 20 Nathan BROWN CANNONDALE-GARMIN s.t. 26 Taylor SHELDON JELLY BELLY s.t. 31 Chad HAGA GIANT-ALPECIN s.t. 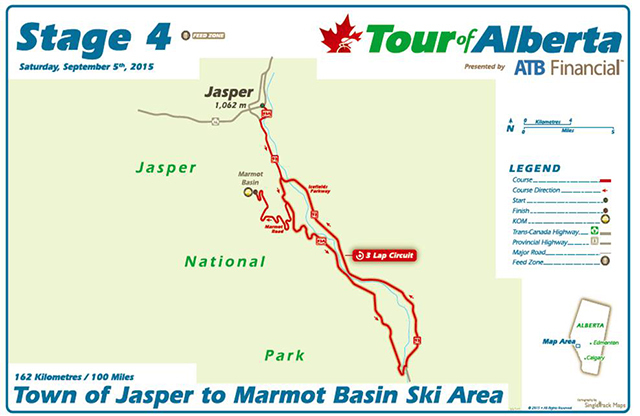 47 Jesse SERGENT TREK s.t. The race: I had to check the results a couple of times before posting them because the same three riders won stage four, in the same order, as had won stage three. The day's early break (Scott Thwaites, Thomas Vaubourzeiz and Logan Owen) almost, just almost, had the legs to go the distance. In fact, the trio wasn't caught until the final climb to the finish. On that climb to the hilltop finish, of course the attacks fired off, one after another. But it was yesterday's stage winner, Tom Jelte Slagter who had the power to make his attack stick. 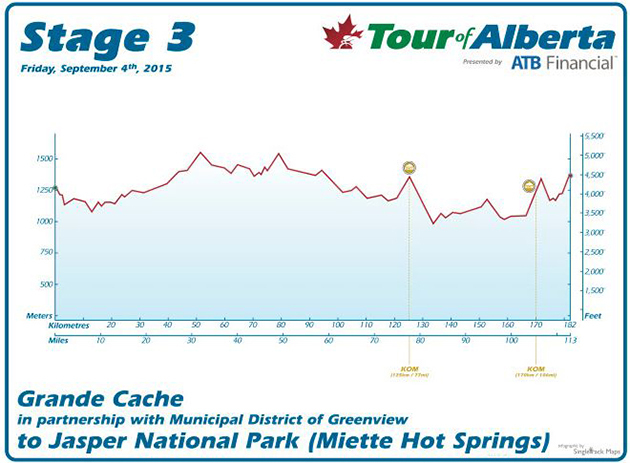 Slagter took off with GC leader Bauke Mollema and Adam Yates not too far behind. Slagter won the stage and Mollema retained his GC leadership, six seconds ahead of second place Adam Yates. 3 Adam YATES ORICA-GREENEDGE s.t. 10 Michael WOODS OPTUM s.t. 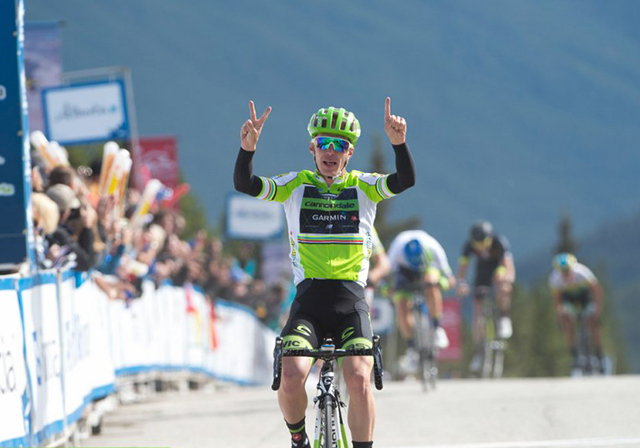 12 Davide FORMOLO CANNONDALE-GARMIN s.t. 21 Jan BARTA BORA-ARGON 18 s.t. 23 Ilnur ZAKARIN KATUSHA s.t. 27 Sergei CHERNETSKI KATUSHA s.t. 29 Alexandr BRAICO JELLY BELLY s.t. 30 Alexander RAY SILBER PRO CYCLING s.t. 32 Ryan ANDERSON OPTUM s.t. 33 Nigel ELLSAY SILBER PRO CYCLING s.t. 34 Fredrik LUDVIGSSON GIANT-ALPECIN s.t. 38 Daniel EATON AXEON CYCLING s.t. 41 Kristoffer SKJERPING CANNONDALE-GARMIN s.t. 43 Florenz KNAUER H&R BLOCK s.t. 44 Adam DE VOS H&R BLOCK s.t. 53 Viacheslav KUZNETSOV KATUSHA s.t. 57 Jesse SERGENT TREK s.t. 59 Sam BEWLEY ORICA-GREENEDGE s.t. 60 Phil O'DONNELL AXEON CYCLING s.t. 61 Michael HEPBURN ORICA-GREENEDGE s.t. 62 Dominik NERZ BORA-ARGON 18 s.t. 63 Chris PUTT AXEON CYCLING s.t. 64 Joshua BERRY JELLY BELLY s.t. 65 Aleksei TCATEVICH KATUSHA s.t. 66 Ramon SINKELDAM GIANT-ALPECIN s.t. 67 Chad BEYER LUPUS RACING TEAM s.t. 68 Bailey MCKNIGHT H&R BLOCK s.t. 69 Tom ZIRBEL OPTUM s.t. 70 Travis MEYER DRAPAC s.t. 71 Hayden ROULSTON TREK s.t. 72 Winston DAVID LUPUS RACING TEAM s.t. 73 Grégory RAST TREK s.t. 74 Alexander PORSEV KATUSHA s.t. 75 Jacob SCHWINGBOTH H&R BLOCK s.t. 78 Michael OLHEISER LUPUS RACING TEAM s.t. 85 Jure RUPNIK H&R BLOCK s.t. 87 Malcom RUDOLPH DRAPAC s.t. 88 Mac BRENNAN HINCAPIE RACING s.t. 89 Jasper BOVENHUIS CANNONDALE-GARMIN s.t. 90 Wouter WIPPERT DRAPAC s.t. 91 Zachary BELL SMART STOP s.t. 92 Simon GESCHKE GIANT-ALPECIN s.t. 94 Justin OIEN AXEON CYCLING s.t. 95 Shane KLINE SMART STOP s.t. 96 Mike STONE LUPUS RACING TEAM s.t. 97 Kris DAHL SMART STOP s.t. 98 Guillaume BOIVIN OPTUM s.t. 99 Miguel BRYON HINCAPIE RACING s.t. 101 Jordan KERBY DRAPAC s.t. 102 Svein TUFT ORICA-GREENEDGE s.t. 103 Peter KONING DRAPAC s.t. 104 Scott THWAITES BORA-ARGON 18 s.t. 105 Sam BENNETT BORA-ARGON 18 s.t. 106 Angus MORTON JELLY BELLY s.t. 107 Thomas SOLADAY OPTUM s.t. 108 Evan MURPHY LUPUS RACING TEAM s.t. 109 Scott ZWIZANSKI OPTUM s.t. 111 Jens MOURIS ORICA-GREENEDGE s.t. 114 William CLARKE DRAPAC s.t. 115 Bernard SULZBERGER DRAPAC s.t. 116 Steve FISHER JELLY BELLY s.t. 117 Graeme BROWN DRAPAC s.t. 118 Kristof VANDEWALLE TREK s.t. 119 Marco COLEDAN TREK s.t. 29 Taylor SHELDON JELLY BELLY s.t. 34 Kristoffer SKJERPING CANNONDALE-GARMIN s.t. 50 Jesse SERGENT TREK s.t. 59 Julian KYER SMART STOP s.t. 120 Travis SAMUEL H&R BLOCK s.t. 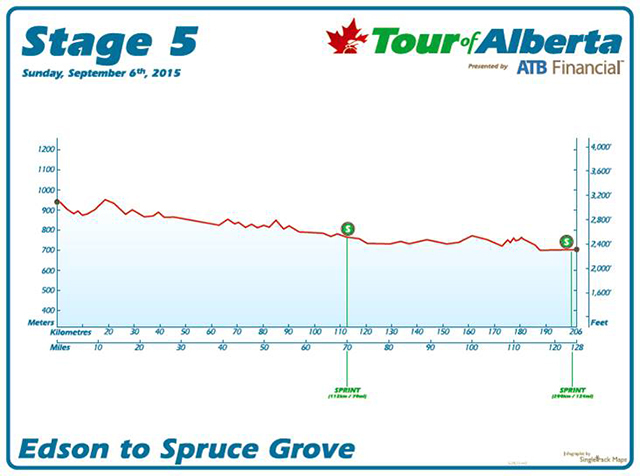 The race: Another cold day in Alberta. It snowed the night before and it was near freezing when the stage started. Plus, there was a light rain to make the day complete. And, there was lots of climbing to make the day truly challenging. A small group went clear early and for the longest time, stubbornly refused to be caught by the chasing pack. It wasn't until the final kilometers on the final climb that the last of the escapees had been rounded up. Near the hilltop-finish Tom Jelte Slagter gave it his all, with Dutch countryman Bauke Mollema right with him to take the stage. Mollema, who had been leading the race after Trek won the opening team time trial, gathered enough bonus time time to become the GC leader again, leading Orica-GreenEdge rider Adam Yates by six seconds. 2 Bauke MOLLEMA TREK s.t. 7 James ORAM AXEON CYCLING s.t. 10 Evan HUFFMAN SMART STOP s.t. 14 Lachlan David MORTON JELLY BELLY s.t. 16 Toms SKUJINS HINCAPIE RACING s.t. 17 Paul VOSS BORA-ARGON 18 s.t. 19 Joseph LEWIS HINCAPIE RACING s.t. 20 Andzs FLAKSIS HINCAPIE RACING s.t. 22 Nathan BROWN CANNONDALE-GARMIN s.t. 26 Ilnur ZAKARIN KATUSHA s.t. 27 Taylor SHELDON JELLY BELLY s.t. 29 Ryan ROTH SILBER PRO RACING s.t. 30 Jan BARTA BORA-ARGON 18 s.t. 32 Chad HAGA GIANT-ALPECIN s.t. 33 Scott THWAITES BORA-ARGON 18 s.t. 34 Aleksei TCATEVICH KATUSHA s.t. 38 Nigel ELLSAY SILBER PRO RACING s.t. 41 Michael MATTHEWS ORICA-GREENEDGE s.t. 44 Travis MCCABE SMART STOP s.t. 47 Sven erik BYSTRØM KATUSHA s.t. 50 Hayden ROULSTON TREK s.t. 54 Matthieu JEANNES LUPUS RACING TEAM s.t. 55 Wouter WIPPERT DRAPAC s.t. 56 Fredrik LUDVIGSSON GIANT-ALPECIN s.t. 57 Viacheslav KUZNETSOV KATUSHA s.t. 58 Garrett MCLEOD H&R BLOCK s.t. 59 Jesse SERGENT TREK s.t. 60 Travis LIVERMON SMART STOP s.t. 70 Ramon SINKELDAM GIANT-ALPECIN s.t. 71 Jure RUPNIK H&R BLOCK s.t. 72 Michael OLHEISER LUPUS RACING TEAM s.t. 73 Winston DAVID LUPUS RACING TEAM s.t. 74 Malcom RUDOLPH DRAPAC s.t. 75 Eric MARCOTTE SMART STOP s.t. 76 GREGORY DANIEL AXEON CYCLING s.t. 77 Jesse ANTHONY OPTUM s.t. 78 Edward KING CANNONDALE-GARMIN s.t. 79 Phil O'DONNELL AXEON CYCLING s.t. 80 Mike STONE LUPUS RACING TEAM s.t. 81 Kris DAHL SMART STOP s.t. 82 Angus MORTON JELLY BELLY s.t. 83 Peter KONING DRAPAC s.t. 85 Fred RODRIGUEZ JELLY BELLY s.t. 86 Alexander PORSEV KATUSHA s.t. 87 Alexander CATAFORD SILBER PRO RACING s.t. 88 Will ROUTLEY OPTUM s.t. 90 Evan MURPHY LUPUS RACING TEAM s.t. 94 Jordan KERBY DRAPAC s.t. 98 Michael HEPBURN ORICA-GREENEDGE s.t. 99 Marco COLEDAN TREK s.t. 100 Kristof VANDEWALLE TREK s.t. 102 Zachary BELL SMART STOP s.t. 103 Scott ZWIZANSKI OPTUM s.t. 104 Miguel BRYON HINCAPIE RACING s.t. 105 Travis MEYER DRAPAC s.t. 109 Matteo DAL-CIN SILBER PRO RACING s.t. 110 Adam DE VOS H&R BLOCK s.t. 111 Shane KLINE SMART STOP s.t. 112 Graeme BROWN DRAPAC s.t. 113 Sam BENNETT BORA-ARGON 18 s.t. 114 Tyler MAGNER HINCAPIE RACING s.t. 115 Jacob SCHWINGBOTH H&R BLOCK s.t. 116 Thomas SOLADAY OPTUM s.t. 9 Ilnur ZAKARIN KATUSHA s.t. 10 Ryder HESJEDAL CANNONDALE-GARMIN s.t. 13 Aleksei TCATEVICH KATUSHA s.t. 14 Toms SKUJINS HINCAPIE RACING s.t. 17 Joseph LEWIS HINCAPIE RACING s.t. 18 Andzs FLAKSIS HINCAPIE RACING s.t. 30 Kristoffer SKJERPING CANNONDALE-GARMIN s.t. 35 Daniel EATON AXEON CYCLING s.t. 36 Nigel ELLSAY SILBER PRO RACING s.t. 51 Lars VAN DER HAAR GIANT-ALPECIN s.t. 64 Michael OLHEISER LUPUS RACING TEAM s.t. 65 Mike STONE LUPUS RACING TEAM s.t. 71 Eric MARCOTTE SMART STOP s.t. 96 Svein TUFT ORICA-GREENEDGE s.t. 116 Jacob SCHWINGBOTH H&R BLOCK s.t. 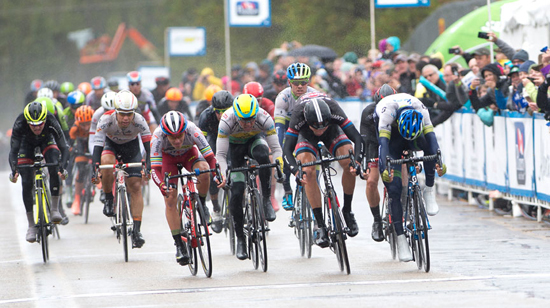 The race: A cold, wet day in Canada greeted the riders this morning. 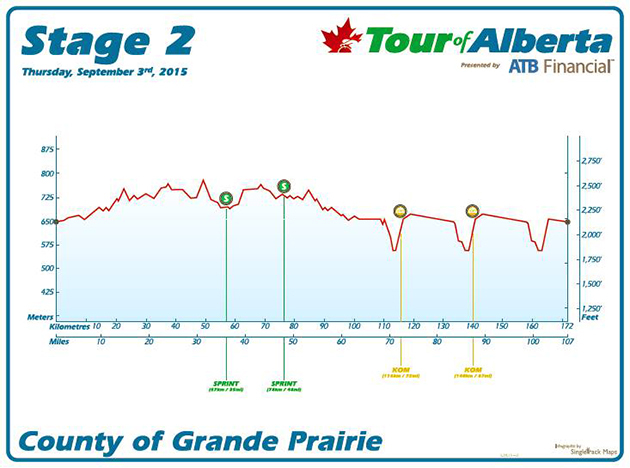 The thermometers may not have risen much, but that did not cool the riders' racing ardor. A break of four riders broke free of the peloton's grip, and at one point had a lead of almost three and a half minutes. That wasn't good enough, and unlike yesterday, the peloton went after them and had the escapees back in the pack with about thirty kilometers to go. There is a reason why the peloton often lets the escape sit out in front until the stage's closing kilometers. If they are caught too early, another group will try to get away, now with fresh legs from sitting in. And that's just what happened. Another quartet jumped away, but were caught near the stage finish. That meant a big group would contest the sprint. Orica-GreenEdge brought Michael Matthews into position and he blasted to the line to win the stage. Since his Orica-GreenEdge team was virtually tied with Trek after the team time trial, the ten bonus seconds he earned for winning the stage made him the new GC leader. After the stage, Matthews had this to say: “It’s really nice to be back on the bike and feel like a professional rider again after the Tour de France and not really being able to animate the race. “We didn’t quite nail the team time trial yesterday so we didn’t have ambitions to help Trek during the stage. We played our cards on hoping they would bring the break back and from about five kilometres to go we took control of the bunch. “From then on it was just perfection really, the guys totally nailed it. We had a plan and they really executed it, even with the twisty roads and a lot of rain. 2 Nikias ARNDT GIANT-ALPECIN s.t. 3 Aleksei TCATEVICH KATUSHA s.t. 4 Travis MCCABE SMART STOP s.t. 6 Michael HEPBURN ORICA-GREENEDGE s.t. 7 Guillaume BOIVIN OPTUM s.t. 8 Logan OWEN AXEON CYCLING s.t. 9 Miguel BRYON HINCAPIE RACING s.t. 10 Jasper BOVENHUIS CANNONDALE-GARMIN s.t. 11 Wouter WIPPERT DRAPAC s.t. 12 Marco COLEDAN TREK s.t. 13 Alexander RAY SILBER PRO RACING s.t. 14 Justin OIEN AXEON CYCLING s.t. 15 Ryan ANDERSON OPTUM s.t. 16 Christian MEIER ORICA-GREENEDGE s.t. 17 Viacheslav KUZNETSOV KATUSHA s.t. 18 Bauke MOLLEMA TREK s.t. 19 Kris DAHL SMART STOP s.t. 20 Evan MURPHY LUPUS RACING TEAM s.t. 21 Shane ARCHBOLD BORA-ARGON 18 s.t. 22 Jesse ANTHONY OPTUM s.t. 23 Alexander PORSEV KATUSHA s.t. 24 Felix COTÉ BOUVETTE H&R BLOCK s.t. 25 Christoph PFINGSTEN BORA-ARGON 18 s.t. 26 Joseph LEWIS HINCAPIE RACING s.t. 27 Lasse Norman HANSEN CANNONDALE-GARMIN s.t. 28 Dion SMITH HINCAPIE RACING s.t. 29 Alexander CATAFORD SILBER PRO RACING s.t. 31 Sergey LAGUTIN KATUSHA s.t. 32 Simon GESCHKE GIANT-ALPECIN s.t. 33 Georg PREIDLER GIANT-ALPECIN s.t. 34 Shane KLINE SMART STOP s.t. 35 Jan BARTA BORA-ARGON 18 s.t. 36 Florenz KNAUER H&R BLOCK s.t. 37 Alexandr BRAICO JELLY BELLY s.t. 38 Malcom RUDOLPH DRAPAC s.t. 39 Sergei CHERNETSKI KATUSHA s.t. 40 Simon SPILAK KATUSHA s.t. 41 Toms SKUJINS HINCAPIE RACING s.t. 43 Zachary BELL SMART STOP s.t. 44 Chad BEYER LUPUS RACING TEAM s.t. 45 Tobias LUDVIGSSON GIANT-ALPECIN s.t. 46 Andzs FLAKSIS HINCAPIE RACING s.t. 47 Scott ZWIZANSKI OPTUM s.t. 48 Eric MARCOTTE SMART STOP s.t. 49 Gavin MANNION JELLY BELLY s.t. 50 Adam DE VOS H&R BLOCK s.t. 51 Michael WOODS OPTUM s.t. 52 Thomas SOLADAY OPTUM s.t. 53 Daniel EATON AXEON CYCLING s.t. 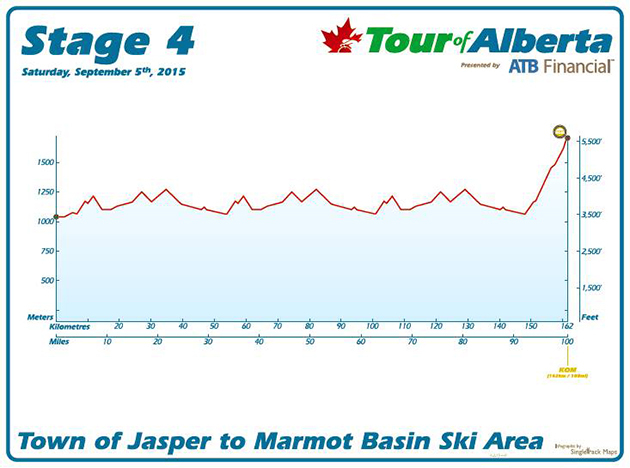 54 Jesse SERGENT TREK s.t. 55 Ilnur ZAKARIN KATUSHA s.t. 56 Chad HAGA GIANT-ALPECIN s.t. 57 Fredrik LUDVIGSSON GIANT-ALPECIN s.t. 58 Fred RODRIGUEZ JELLY BELLY s.t. 59 James ORAM AXEON CYCLING s.t. 60 Paul VOSS BORA-ARGON 18 s.t. 61 Chris PUTT AXEON CYCLING s.t. 63 Lars VAN DER HAAR GIANT-ALPECIN s.t. 64 Sven erik BYSTRØM KATUSHA s.t. 65 Bernard SULZBERGER DRAPAC s.t. 66 Tyler MAGNER HINCAPIE RACING s.t. 67 Mac BRENNAN HINCAPIE RACING s.t. 68 Laurent DIDIER TREK s.t. 69 Nathan BROWN CANNONDALE-GARMIN s.t. 70 Bailey MCKNIGHT H&R BLOCK s.t. 71 Scott THWAITES BORA-ARGON 18 s.t. 72 John HORNBECK HINCAPIE RACING s.t. 73 Michael LE ROSSIGNOL SILBER PRO RACING s.t. 74 Matteo DAL-CIN SILBER PRO RACING s.t. 75 Ryder HESJEDAL CANNONDALE-GARMIN s.t. 76 Kristoffer SKJERPING CANNONDALE-GARMIN s.t. 77 Sam BEWLEY ORICA-GREENEDGE s.t. 78 Tom Jelte SLAGTER CANNONDALE-GARMIN s.t. 79 Michael OLHEISER LUPUS RACING TEAM s.t. 80 Svein TUFT ORICA-GREENEDGE s.t. 81 Davide FORMOLO CANNONDALE-GARMIN s.t. 82 Edward KING CANNONDALE-GARMIN s.t. 83 Geoffrey CURRAN AXEON CYCLING s.t. 85 Ryan ROTH SILBER PRO RACING s.t. 86 Taylor SHELDON JELLY BELLY s.t. 87 Derrick ST JOHN SILBER PRO RACING s.t. 88 Nigel ELLSAY SILBER PRO RACING s.t. 89 Winston DAVID LUPUS RACING TEAM s.t. 90 GREGORY DANIEL AXEON CYCLING s.t. 91 Ramon SINKELDAM GIANT-ALPECIN s.t. 92 Lachlan David MORTON JELLY BELLY s.t. 93 Grégory RAST TREK s.t. 94 Matthieu JEANNES LUPUS RACING TEAM s.t. 95 Angus MORTON JELLY BELLY s.t. 96 Matthew BUSCHE TREK s.t. 97 Hayden ROULSTON TREK s.t. 98 Julian KYER SMART STOP s.t. 99 Kyle MURPHY LUPUS RACING TEAM s.t. 100 Mike STONE LUPUS RACING TEAM s.t. 101 Tom ZIRBEL OPTUM s.t. 102 Jure RUPNIK H&R BLOCK s.t. 103 Garrett MCLEOD H&R BLOCK s.t. 104 Evan HUFFMAN SMART STOP s.t. 105 Phil O'DONNELL AXEON CYCLING s.t. 3 Christian MEIER ORICA-GREENEDGE s.t. 4 Bauke MOLLEMA TREK s.t. 5 Adam YATES ORICA-GREENEDGE s.t. 6 Jesse SERGENT TREK s.t. 7 Svein TUFT ORICA-GREENEDGE s.t. 8 Matthew BUSCHE TREK s.t. 9 Hayden ROULSTON TREK s.t. 10 Luke DURBRIDGE ORICA-GREENEDGE s.t. 14 Simon SPILAK KATUSHA s.t. 15 Ilnur ZAKARIN KATUSHA s.t. 18 Christoph PFINGSTEN BORA-ARGON 18 s.t. 19 Jan BARTA BORA-ARGON 18 s.t. 21 Scott THWAITES BORA-ARGON 18 s.t. 23 Georg PREIDLER GIANT-ALPECIN s.t. 24 Chad HAGA GIANT-ALPECIN s.t. 25 Ramon SINKELDAM GIANT-ALPECIN s.t. 27 Dion SMITH HINCAPIE RACING s.t. 28 Toms SKUJINS HINCAPIE RACING s.t. 29 Andzs FLAKSIS HINCAPIE RACING s.t. 30 John HORNBECK HINCAPIE RACING s.t. 32 Lasse Norman HANSEN CANNONDALE-GARMIN s.t. 33 Nathan BROWN CANNONDALE-GARMIN s.t. 34 Ryder HESJEDAL CANNONDALE-GARMIN s.t. 35 Kristoffer SKJERPING CANNONDALE-GARMIN s.t. 36 Tom Jelte SLAGTER CANNONDALE-GARMIN s.t. 39 Malcom RUDOLPH DRAPAC s.t. 41 Alexander CATAFORD SILBER PRO RACING s.t. 42 Sergei CHERNETSKI KATUSHA s.t. 43 Matteo DAL-CIN SILBER PRO RACING s.t. 44 Ryan ROTH SILBER PRO RACING s.t. 45 Nigel ELLSAY SILBER PRO RACING s.t. 47 Evan MURPHY LUPUS RACING TEAM s.t. 48 Jesse ANTHONY OPTUM s.t. 49 Chad BEYER LUPUS RACING TEAM s.t. 50 Scott ZWIZANSKI OPTUM s.t. 52 Michael OLHEISER LUPUS RACING TEAM s.t. 53 Kyle MURPHY LUPUS RACING TEAM s.t. 54 Mike STONE LUPUS RACING TEAM s.t. 55 Tom ZIRBEL OPTUM s.t. 59 Daniel EATON AXEON CYCLING s.t. 60 James ORAM AXEON CYCLING s.t. 61 Geoffrey CURRAN AXEON CYCLING s.t. 62 GREGORY DANIEL AXEON CYCLING s.t. 65 Kris DAHL SMART STOP s.t. 66 Zachary BELL SMART STOP s.t. 67 Eric MARCOTTE SMART STOP s.t. 68 Julian KYER SMART STOP s.t. 69 Evan HUFFMAN SMART STOP s.t. 72 Joshua BERRY JELLY BELLY s.t. 73 Gavin MANNION JELLY BELLY s.t. 74 Fred RODRIGUEZ JELLY BELLY s.t. 75 Taylor SHELDON JELLY BELLY s.t. 76 Lachlan David MORTON JELLY BELLY s.t. 81 Adam DE VOS H&R BLOCK s.t. 82 Garrett MCLEOD H&R BLOCK s.t. 89 Sven erik BYSTRØM KATUSHA s.t. 90 Grégory RAST TREK s.t. 96 Bailey MCKNIGHT H&R BLOCK s.t. 100 Lars VAN DER HAAR GIANT-ALPECIN s.t. 103 Dominik NERZ BORA-ARGON 18 s.t. 113 Sam BEWLEY ORICA-GREENEDGE s.t. 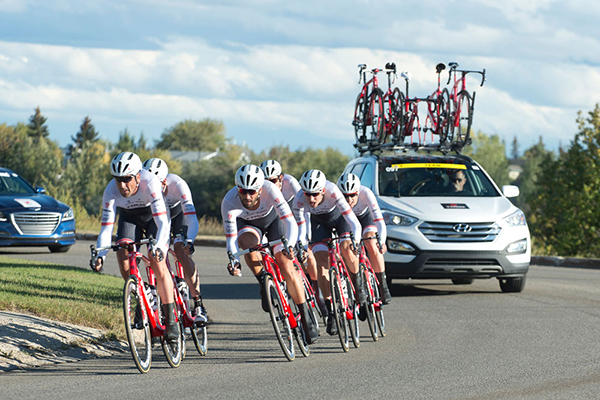 The Race: Trek Factory Racing beat Orica-GreenEdge in the Tour of Alberta's first stage by less than a second. But, that was good enough to give them the stage win and put the first rider of their team across the line, Bauke Mollema, in the leader's jersey. Trek had lost three men by the half-way point, yet still had enough horsepower to win the stage. Take a look at the photo above. 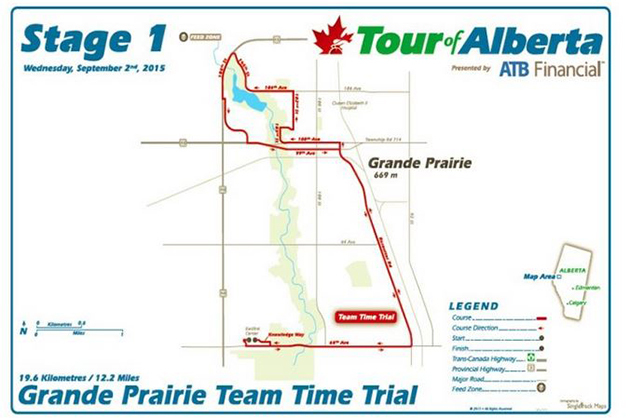 The riders are using regular road bikes, not time trial bikes. The race rules for the day mandated UCI road racing bike only. That was probably a blessing for the smaller, less richly funded teams racing here. “This was the first TTT win in my life," said Bauke Mollema. “It was a big team effort and everyone gave everything he had. 11 LUPUS RACING TEAM s.t. 2 Jesse SERGENT TREK s.t. 3 Hayden ROULSTON TREK s.t. 4 Marco COLEDAN TREK s.t. 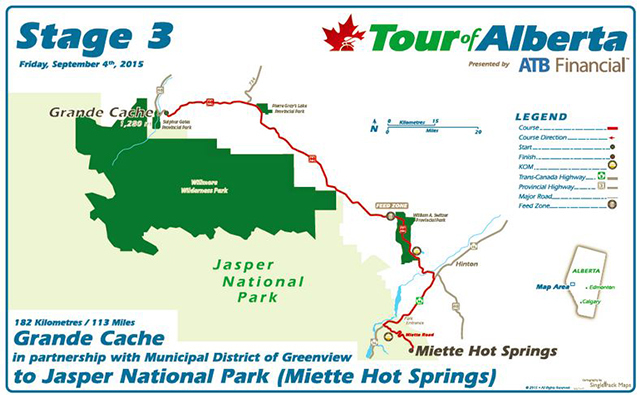 5 Matthew BUSCHE TREK s.t. 6 Christian MEIER ORICA-GREENEDGE s.t. 8 Michael MATTHEWS ORICA-GREENEDGE s.t. 9 Adam YATES ORICA-GREENEDGE s.t. 12 Sergey LAGUTIN KATUSHA s.t. 13 Simon SPILAK KATUSHA s.t. 14 Viacheslav KUZNETSOV KATUSHA s.t. 17 Sam BENNETT BORA-ARGON 18 s.t. 18 Paul VOSS BORA-ARGON 18 s.t. 20 Scott THWAITES BORA-ARGON 18 s.t. 22 Simon GESCHKE GIANT-ALPECIN s.t. 23 Ramon SINKELDAM GIANT-ALPECIN s.t. 25 Georg PREIDLER GIANT-ALPECIN s.t. 27 Toms SKUJINS HINCAPIE RACING s.t. 28 John HORNBECK HINCAPIE RACING s.t. 29 Joseph LEWIS HINCAPIE RACING s.t. 30 Andzs FLAKSIS HINCAPIE RACING s.t. 32 Ryder HESJEDAL CANNONDALE-GARMIN s.t. 34 Jasper BOVENHUIS CANNONDALE-GARMIN s.t. 35 Tom Jelte SLAGTER CANNONDALE-GARMIN s.t. 36 Davide FORMOLO CANNONDALE-GARMIN s.t. 37 Lasse Norman HANSEN CANNONDALE-GARMIN s.t. 39 Graeme BROWN DRAPAC s.t. 40 William CLARKE DRAPAC s.t. 41 Wouter WIPPERT DRAPAC s.t. 42 Malcom RUDOLPH DRAPAC s.t. 44 Ryan ROTH SILBER PRO CYCLING s.t. 45 Alexander RAY SILBER PRO CYCLING s.t. 46 Alexander CATAFORD SILBER PRO CYCLING s.t. 47 Nigel ELLSAY SILBER PRO CYCLING s.t. 48 Matteo DAL-CIN SILBER PRO CYCLING s.t. 50 Tom ZIRBEL OPTUM s.t. 51 Scott ZWIZANSKI OPTUM s.t. 52 Ryan ANDERSON OPTUM s.t. 53 Michael WOODS OPTUM s.t. 54 Evan MURPHY LUPUS RACING s.t. 55 Kyle MURPHY LUPUS RACING s.t. 56 Thomas VAUBOURZEIX LUPUS RACING s.t. 57 Mike STONE LUPUS RACING s.t. 58 Chad BEYER LUPUS RACING s.t. 59 Michael OLHEISER LUPUS RACING s.t. 63 Logan OWEN AXEON CYCLING s.t. 64 James ORAM AXEON CYCLING s.t. 65 GREGORY DANIEL AXEON CYCLING s.t. 66 Geoffrey CURRAN AXEON CYCLING s.t. 69 Eric MARCOTTE SMART STOP s.t. 70 Julian KYER SMART STOP s.t. 71 Evan HUFFMAN SMART STOP s.t. 72 Zachary BELL SMART STOP s.t. 73 Travis MCCABE SMART STOP s.t. 74 Travis LIVERMON SMART STOP s.t. 77 Lachlan David MORTON JELLY BELLY s.t. 78 Alexandr BRAICO JELLY BELLY s.t. 79 Taylor SHELDON JELLY BELLY s.t. 80 Fred RODRIGUEZ JELLY BELLY s.t. 84 Adam DE VOS H&R BLOCK s.t. 85 Jacob SCHWINGBOTH H&R BLOCK s.t. 86 Garrett MCLEOD H&R BLOCK s.t. 87 Travis SAMUEL H&R BLOCK s.t. 91 Guillaume BOIVIN OPTUM s.t. 92 Grégory RAST TREK s.t. 98 Miguel BRYON HINCAPIE RACING s.t. 104 Lars VAN DER HAAR GIANT-ALPECIN s.t. 107 Dominik NERZ BORA-ARGON 18 s.t. 108 Cesare BENEDETTI BORA-ARGON 18 s.t.